Math Games 1st Grade is a beautifully presented app that encourages children to practice and develop their early numeracy skills. It rewards improvement and returning to its challenges on subsequent days. There are 9 different activities in the Math Games 1st Grade app each of which lets children practice their developing numeracy skills. Although its title suggests that its primary market is not the UK, parents, and teachers should not be put off from considering this app. Its content is perfectly pitched for young children whatever educational system they are in and it is a superb app. The counting, comparing numbers and simple arithmetic challenges within the app are easily understood and provide meaningful practice. 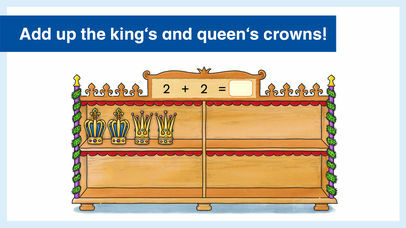 Their layout and method of interaction encourage children to think about the maths in the correct way. They are focused more on providing practice than teaching new skills but a little bit of thought or some well-judged help from an adult will help children to advance when engaging with the app. A child's engagement and achievements within the app can be tracked through badges that are awarded for completing the exercises. The artwork makes this app special. It has a lovely hand-drawn quality reminiscent of favourite children's books. It is simply but not primitively animated as little touches bring the different elements to life. 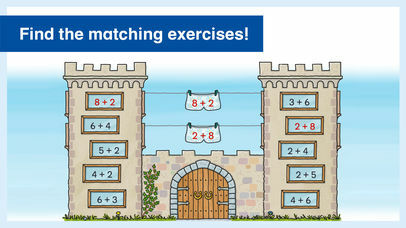 It is also varied as each maths exercise uses a different scene within the fantasy medieval setting of the app. Instructions, encouragement, feedback and helpful hints are spoken - children with limited literacy skills will not be held back in using this app to develop their numeracy skills. The settings page within the app is simple but contains a facility that is all too often left off apps but which teachers find very useful - the app's saved data can be easily reset. Some apps can only do this if they are uninstalled and re-installed again which can be very inconvenient for a school administered device. In addition to this feature, the activities can be all unlocked allowing teachers to use the app as an instructional aid, either with a small group on the device itself or with the screen mirrored to a class display. So often apps miss out these features which bring a whole new usefulness to the app in the classroom. It is great to see them here. There are a couple of areas where the app could be improved. Firstly, it could be made even more classroom-friendly by allowing multiple children to be tracked within it. As some of the achievement badges can only be won by multiple uses on different days, it can only be used in this way by a single child. This doesn't detract from its main usefulness of allowing children to practice all of the activities in a single day but it would be nice for children in a classroom to have the incentive to practice on other days too. The final criticism is of its request for the player to leave a review on the app store after completing all of the activities. Apps aimed at young children should not lead them out of the app into other ones. As well as being incongruous with the otherwise 5 perfectly realised child-friendly experience, it is unlikely to yield any meaningful reviews considering the ages of the children who will be playing it. This prompt should be moved to the settings page. These suggestions for how the app could be improved should not put anybody off buying this app. When measured against the beautiful presentation and careful design of the activities, they are minor points. There are a lot of maths practice apps for young children but few that display such a consistently high standard of presentation and careful design. 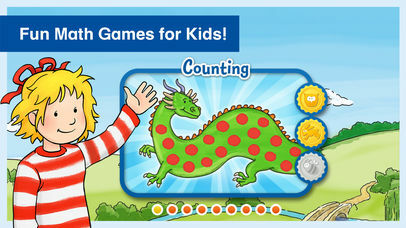 Both parents and teachers should consider this app to help their young children build their confidence in numeracy. Connie lets your child experience plenty of great adventures in the Knight's Castle while practicing all of the important math problems taught during the first year at school. The app was developed in cooperation with educationalists and designed specifically to enable playful learning. • Nine learning areas, unlocked by completing them in a defined order. • Various difficulty levels to adapt the learning games to the child's current knowledge. • Individual feedback and learning hints. • Three-tier reward system for long-term motivation. The dragon Merlin gets red spots from sneezing. And they don't disappear until your child has counted them all. Treasure chests are stacked in the treasury of the Knight's Castle. The treasurer has numbered them and cast a spell so that they can only be opened in the right order. 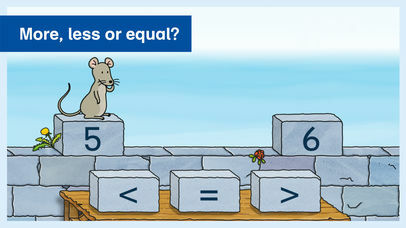 Felix the mouse wants to get to his girlfriend Emily. Unfortunately, there are a few gaps in the battlements that prevent him from reaching his damsel. Your child is asked to help by slotting the correct symbol (greater than, less than or equal to) into a gap on the wall between a series of numbers. The king and the queen keep their crowns in a shelf. They need your child to help them add them all up. Two canons are used to practice breaking up numbers. Your child is asked to load the canons in such a way that the numbers on the balls add up to a certain number. Sammy the spook makes some of the knights' helmets on the shelf disappear during the witching hour. Your child is asked to subtract the transparent helmets from the opaque ones in order to solve the task. The residents of the castle have gotten their clothes mixed up on laundry day. To solve the exercises, your child is asked to find the swapping tasks that belong together and then calculate the results. The bats need to be put to bed. Your child is asked to find the matching pairs of bats with the same math problems and then calculate the inverse equation in each case. 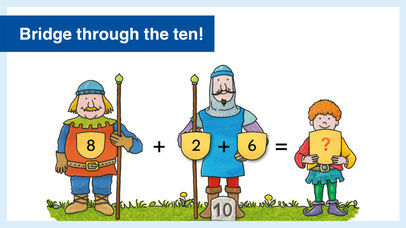 In this math problem, knights help your child to solve addition and subtraction equations by breaking down the summand/subtrahend to ten and then adding/subtracting the rest. If you have any questions, please feel free to shoot us an e-mail (apps@carlsen.de). We’ll be more than happy to answer them for you!